Ford Fiesta and Ford Focus | What Car? 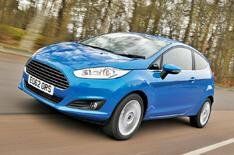 The Fiesta has been our favourite supermini for quite a while. There are some fantastic deals to be had with just a little haggling; the best bargains are found through internet brokers, but dont rule out your local dealer, who should offer a hefty discount, and pay 250 towards your finance deposit if you buy using a low-rate Ford Credit finance plan. I had a 2008 Fiesta previously, but this car is a huge difference. The build quality is excellent and I love the soft-touch dashboard materials. Also, Im over 6ft tall and have to bring the seat forward quite a few clicks because it goes back so far. The Focus does one thing better than any other small hatchback it handles brilliantly, while comfortably accommodating a family of four. Crucially you can get your hands on one without much outlay, with savings to be had wherever you buy. Ford will pay 2000 towards your finance deposit on a low-APR Ford Credit finance plan, and itll throw in a free Appearance Pack worth 525. I bought my Focus after negotiating an 18% discount plus options worth over 2500, which I think was a good deal. The car handles very well, and the ride is smooth on the 18-inch alloys. Standard kit is also very good everything you need for a family car.